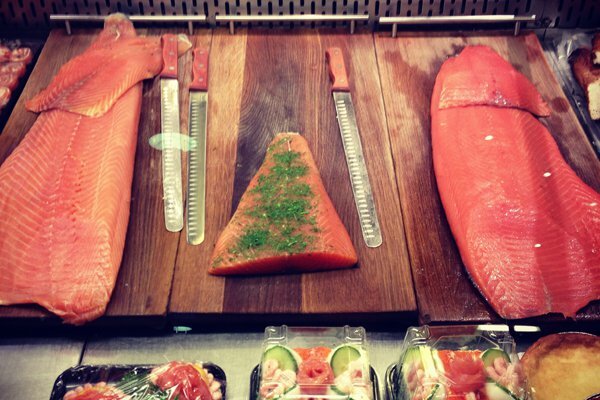 Fresh salmon at the Östermalm Food Hall. Photo: Stephanie March. It's chic, it's sporty, it's William to Copenhagen's Harry. 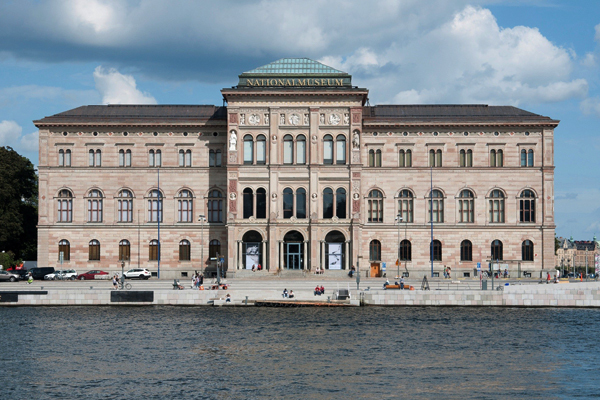 Contributing editor Stephanie March drops by the Swedish capital and is totally charmed. STOCKHOLM – If Copenhagen is the sociable, popular, younger sibling, Stockholm is the lovely, quieter, older one who gets the good grades and has a sly sense of humor. Think William to Harry. The people, gorgeous creatures all of them, are very proud of their country and eager to show it off. From hiking to boating to cross-country skiing, Sweden offers all sorts of athletic opportunities, many within an hour of this chic, walkable capital city. Take a walk! This city is very doable on foot, and there are about a thousand places to stop for a snack or drink. Take in the and stroll over to the for Sancerre and crayfish. Photo by Hans Thorwid / Courtesy of the Nationalmuseum. Spend time in , The Old Town, for great shopping and 18th-century architecture. It’s like time travel. With artisanal boutiques. , the great photography museum, features works from all sorts of international artists, like Henri Cartier-Bresson, David LaChapelle, and Helmut Newton. , The Royal Opera House, has sensational acoustics and fabulous old-world craftsmanship. See a show or just consume four plates of Swedish meatballs and vodka in The Opera Bar like I did. It was a fabulous way to end a chilly afternoon. When it’s warm, take it to one of the many beaches that are all over town and totally accessible to the public. And do a little skinny-dipping. Stockholm takes great care to make sure its coastal areas are pristine and safe. When it’s cold, don't miss the . Utterly charming and close to post-skating toddies at The Opera Bar or Grand Hotel. Tour the canals. Stockholm is known as the Venice of the North and is best seen by water. I found a terrific store near the Nationalmuseum called . This is where I did not buy a Jerome Dreyfuss clutch or an amazing gold cuff for reasons that seem very silly in hindsight. My husband and I stayed at , and it was terrific. The super chic accommodations were also very comfortable (when form overwhelms function, I get crabby). We got absolutely spot-on recommendations for bars and restaurants, and the concierge arranged one of the best guides I’ve ever had. The hotel bar manages to be both cozy and sleek. has a great reputation, but is the place my parents want to stay. is a cheerful, beautifully stocked traditional food hall with great stalls for a quick lunch. Do not miss and the crayfish skagen. Left: Seafood at Sturehof, courtesy of Sturehof. Right: Entrance to Teatergrillen, courtesy of Teatergrillen. is like a Swedish Balthazar and totally fun. 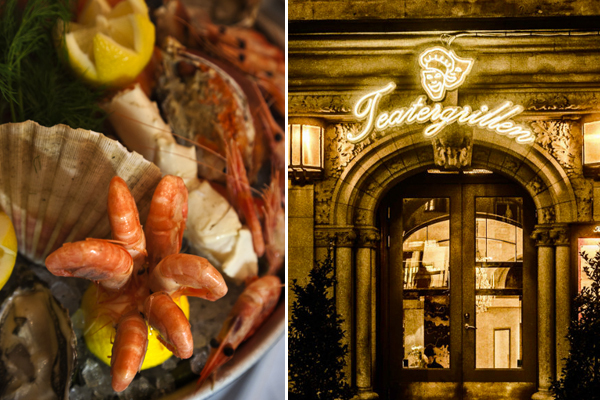 It’s always a good hour of the day to be there — have a seafood plateau and reindeer. near the Royal Dramatic Theatre is a must-see. Brass fixtures, velvet banquettes, cocktails, and cote de boeuf to beat the band. Our server looked like a Swedish Athena. She knew all and was magical. is a bar connected to Teatergrillen via their shared kitchen. Should the staff deem you cool enough to take this passage, as opposed the one above ground, you will find yourself in a bangin’ bar filled with well-dressed Swedes — without having to face a bouncer. Xoko (Rörstrandsgatan 15; +46-8-31-84-87) is the chocolatier famous for designing desserts for the Nobel awards. If you do not anticipate receiving a Nobel of your own, you can easily make your way here for some crazy good chocolate. I had mocha and a cookie with Swedish licorice that I’ll never forget. Fly: Stockholm is easy from my home, New York. Fly direct, for a lot of money, on Scandinavian Airlines, or connect through hubs like Amsterdam and Heathrow for much less. Train: The train service is particularly good, so consider a train if you find yourself nearby in, say, Berlin or Copenhagen. Boat: There are overnight ferries from Oslo and Helsinki. Getting Around: Walking the occasional taxi is the way I like it, although I understand the subway is decent. I was in Stockholm between Christmas and New Year’s and, boy, was it dark. The sun set at 3:15 p.m. That said, almost every museum or restaurant is open between 11 a.m. and 4 p.m., and the rest of the time can be spent in a great bar. Summer has nearly 20 hours of daylight, and the Swedes spend all of it outside (in a cabin, in a park, on a boat, swimming). Both extremes have their charms. Be sure to pack good show shoes for ice and slippery sidewalks in the winter, but don’t skimp on the style. These folks know cold-weather fashion. Lands’ End it is not. Tip at least ten percent, but that should do it. This is a heavily taxed, heavily subsidized part of the world. The tipping culture is not the same. Keep in mind that due to the aforementioned taxing, Stockholm is pricey. Be prepared. One of the best guides I’ve ever had is David Barda, who runs a terrific, comprehensive touring company called . He can arrange everything from jeep safaris and Lapland expeditions to cruising on a yacht, and activities are not limited to the Stockholm area. Film: Any Ingmar Bergman, like and . And Lasse Hallström, director of such films as and . I watched , which has nothing whatsoever to do with Sweden, except that Lena Olin is in it and she is arguably one of Sweden’s foxiest exports. Inset photos, from top: The Opera Bar by Max Plunger / courtesy of The Royal Opera House. 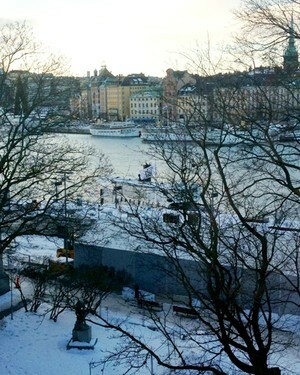 Stockholm in winter by Stephanie March. Stephanie, a Gentedimontagna contributing editor, is an actor, activist, and chronic wanderer. You can follow her at @marchstephanie on and . She travels for the sheer animal pleasure of seeing something new.